Most of us think of winter as a time to slow down, stay indoors, and try to hibernate in front of the fire. For area boatshops winter is anything but a slow time. As a matter of fact, many shops report this winter to be busier than ever. 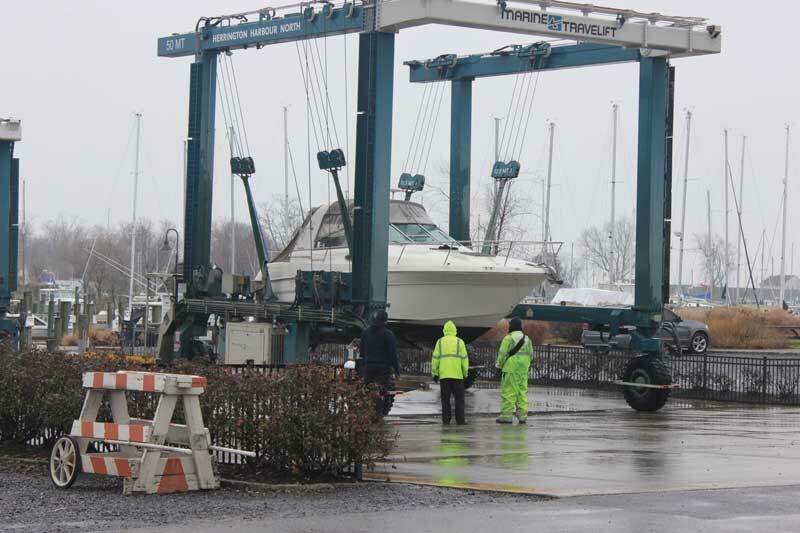 Captain Rick Franke brings us the February 2019 Boatshop Reports. A Judge Yachts 265C center console ready for delivery at Judge Yachts in Denton, MD. Jared Satchell working on a teak deck replacement on a classic Chris-Craft at Campbell’s Boat Yard in Oxford, MD. Bethany Ziegler of the Chesapeake Bay Maritime Museum (CBMM) reports on the museum’s boatshop in St. Michaels, MD. 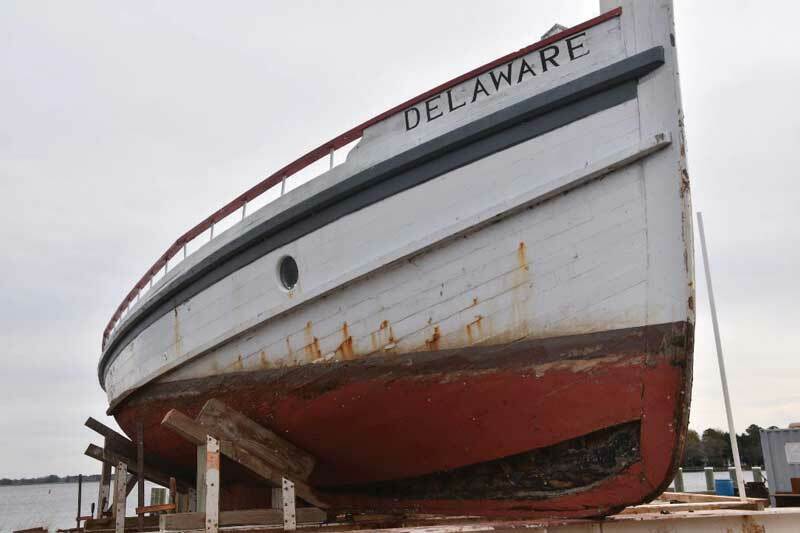 “Chesapeake Bay Maritime Museum Shipwright Duncan Macfarlane, the lead on CBMM’s restoration of 1912 river tug Delaware, reports that much prep work was done for the project early this year. In January, Delaware’s hull was moved to her space adjacent to the marine railway by the middle of January, after the completion of a grading project. Her cabin top was removed by crane in the fall of 2018 to allow shipwrights greater access to work on the stem-to-stern restoration. The 1912 river tug Delaware on the railway at the Chesapeake Bay Maritime Museum in St Michaels, MD. We haven’t heard from Alex Schlegel at Hartge Yacht Yard in Galesville, MD, for a while. This month he shares some insight into what goes on at a busy yard this time of year. “As you would expect, work decreased in the recession 10 years ago. Two years ago in November our work suddenly increased by about 20 percent. Most of the increase has been in Awlgrip painting and carpentry work, but all aspects of our services have experienced an increase in demand. It seems people are using their boats more. We have done more haul outs for repairs to bent props than usual, and only a few were due to the Susquehanna debris. This winter’s work load is also filled with paint and woodworking jobs. 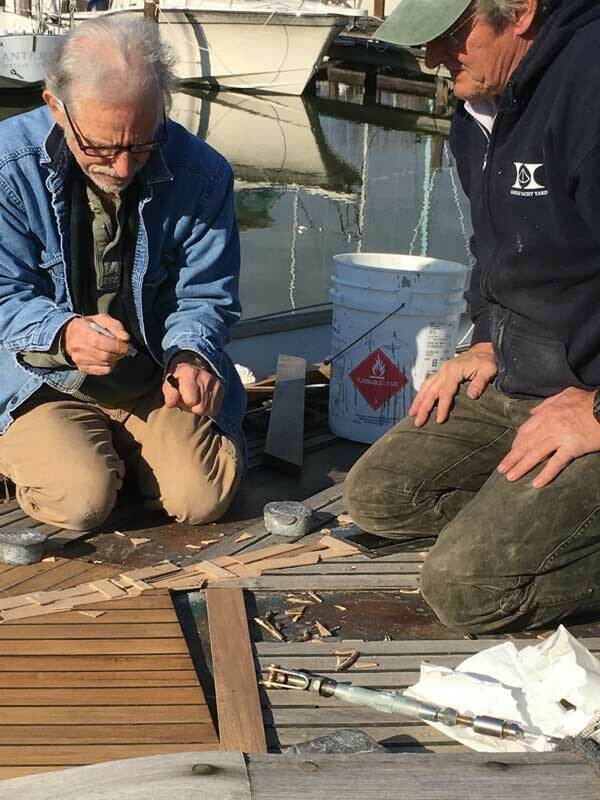 Allen Cady (L) and Peter Bell restoring a teak deck at Hartge Yacht Yard in Galesville, MD. “Kelsey Averill is in charge of the winter haul outs for the first time since Nick Schlegel, who had been doing the job for more than 40 years, passed away last winter. Kelsey is ably assisted by Dave Voss. There is a lot more than meets the eye regarding winter haul out: scheduling, coordinating with the winterizing crew, moving boats to the yard from other marinas, un-stepping of masts, removing of sails, precise sling placement to miss the running gear, not lifting the boat with slings on the lightweight trailing edges of keels, dealing with the slippery curves to the forefoot, and blocking the slings away from vulnerable spray rails. Boats must be blocked level so decks and cockpits drain properly. 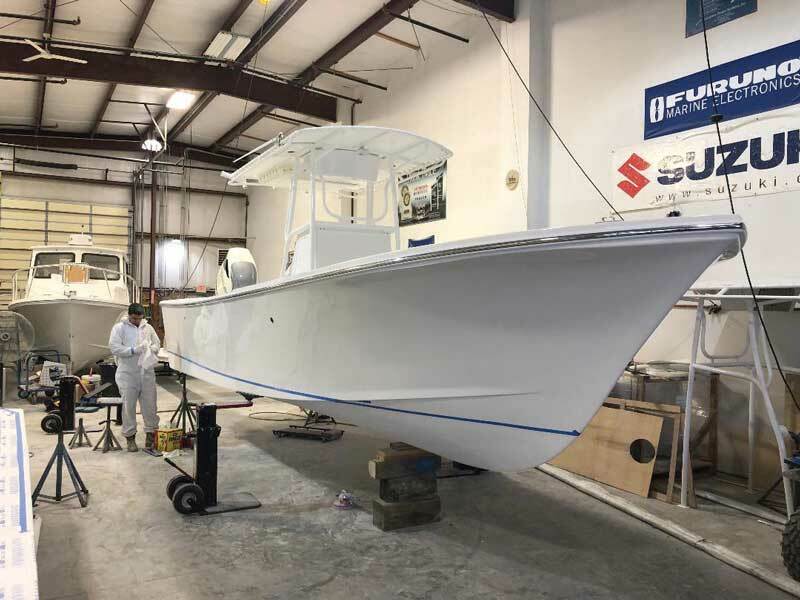 At Osprey Marine Composites at Herrington Harbor North in Tracys Landing, MD, shop manager J.J. Wilson conducted a quick tour of a very busy shop. 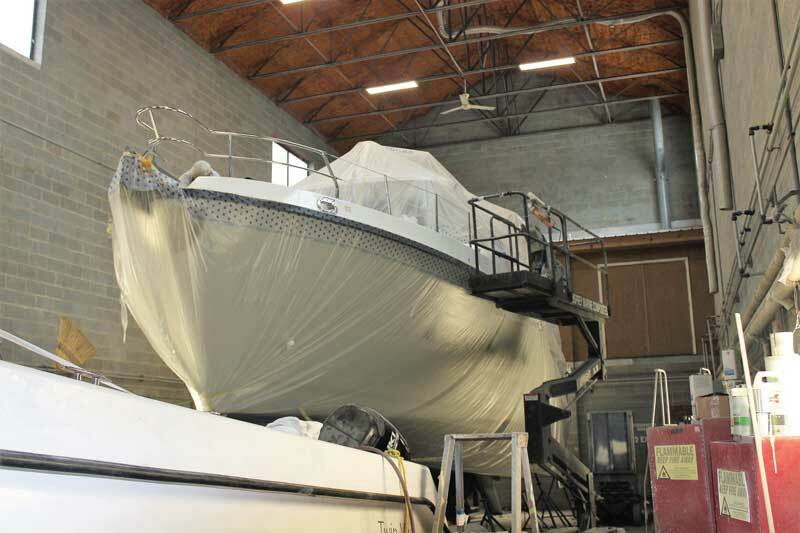 In the main bay is a Nordhaven 40 in for multiple gel coat repairs, a Wellcraft 22 in for extensive warranty work, as well as a Twin Vee Catamaran having fuel tanks replaced. In a smaller bay is an Outbound 47 with a hole in the port side caused by hurricane damage. Next door is a Formula 40 Performance Cruiser with extensive damage to her starboard side after being blown onto the rocks by a microburst during a thunderstorm. 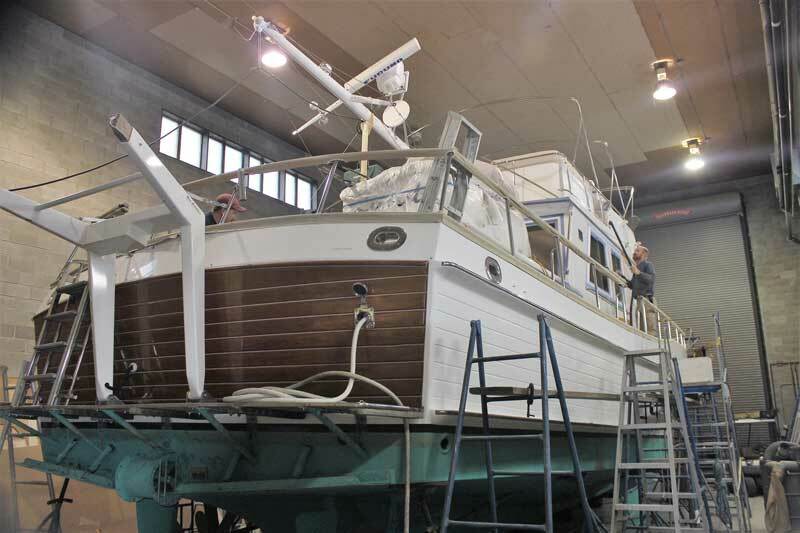 In the last bay, a Mainship Pilot II 34 named Rum Runner II was just brought in for a new coat of Awlgrip. At Phipps Boat Works in Deale, MD, the pace has not slackened with the colder weather. A Grand Banks 50 trawler fills up the work bay. Buster says she’s in for extensive woodwork repairs, window replacements, and varnish work. He also reports that he has three more Grand Banks jobs lined up for the winter and it will be a busy one. 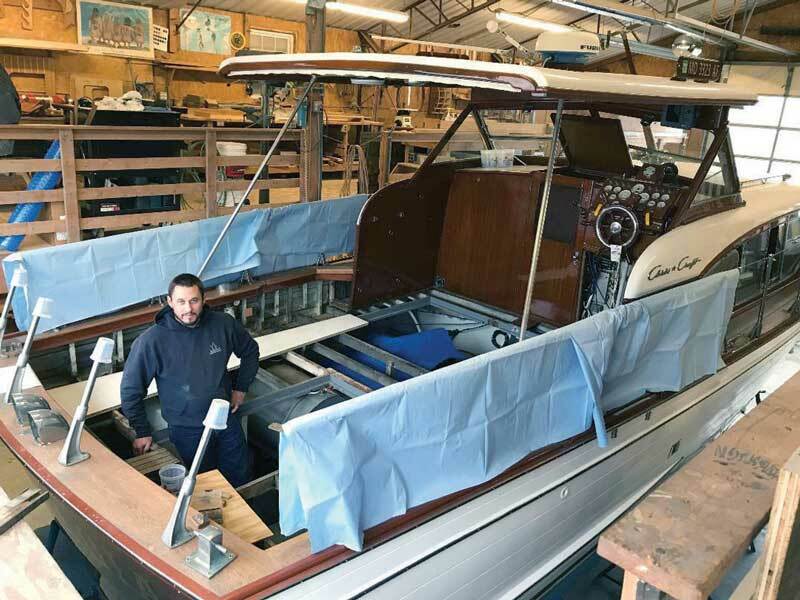 Hank Reiser of Marine Service, LLC at Pocohontas Marina in Edgewater, MD, reports that the transom rebuilding underway on the 1951 Chris Craft Commander is nearly complete. The rest of the hull has been surveyed and the many layers of old paint soda blasted off. “We should be finished with the Chris by March, when we get busy recommissioning again,” Hank explained. “The owner plans to show the boat at the Antique and Classic Boat Festival in June,” he concluded. Other projects in Hank’s shop in Edgewater include the restoration of Stand Fast, a 1957 Lyman 23, and replacing the seized up Yanmar Diesel on a 70s Tanzer 28 with a rebuilt three-cylinder Universal. 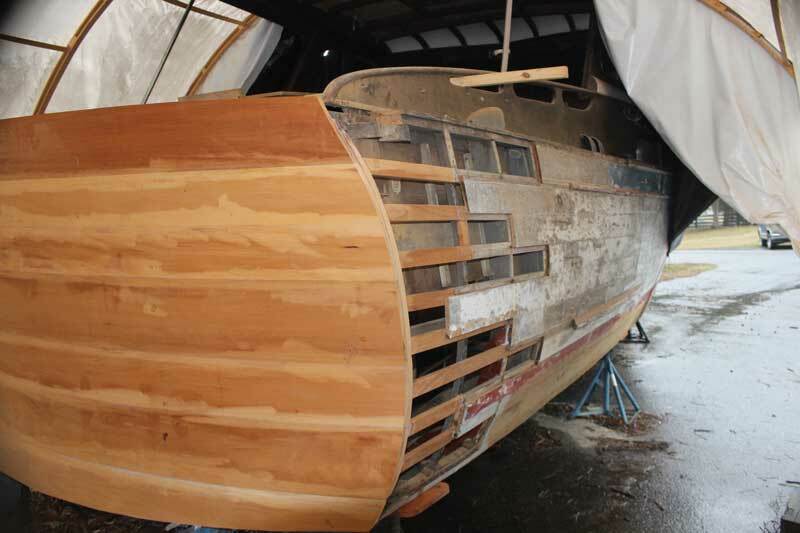 A new transom is part of the restoration of a 1951 Chris-Craft Commander at Marine Service at Pocohontas Marina in Edgewater, MD. So even if your winter sport is sitting in front of a roaring fire, the cold weather will not last forever. The days are getting longer, and spring is not that far away. Our busy boatshops are doing their part to make sure our boats are ready when it arrives.